Ruest took a railroad plagued with service problems and serious network capacity shortages and implemented aggressive capital investment and service quality programs. These efforts have produced outstanding results, in terms of traffic growth and profitability. For example, CN’s engineering team completed more than 80% of expansion projects while the network was under heavy traffic. And in Ruest’s first few months as chief executive, CN hired hundreds of new line employees in train and engine service, laying a strong foundation for the railroad’s continued success. Ruest sees strong growth opportunities ahead, across multiple commodities and new supply chain services. 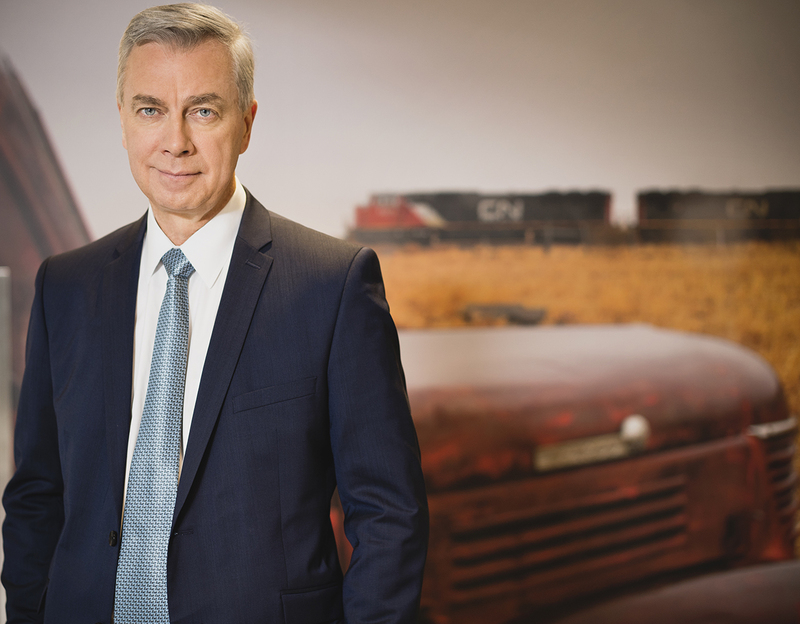 Ruest was appointed CN President and CEO in July 2018, after having served as Interim President and CEO since March 2018. He was previously Executive Vice President and Chief Marketing Officer since January 2010, with responsibility for providing strategic direction and leadership for CN’s Sales, Marketing and CN Supply Chain Solutions groups. 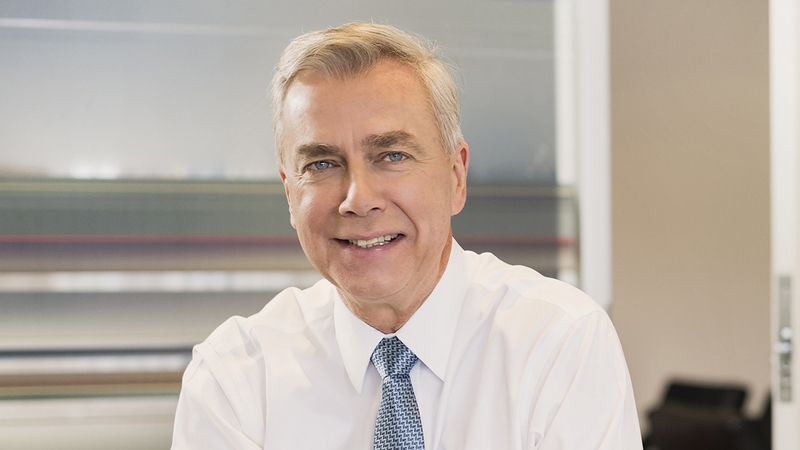 Ruest joined CN in 1996 as Vice President Petroleum and Chemicals. He was appointed Vice President Industrial Products in 2003, Vice President Marketing in 2004, and Senior Vice President Marketing in June 2006. Prior to this, Ruest worked for 16 years at a major international chemical company. Ruest holds a Masters in Business Administration in Marketing from HEC Montréal (Université de Montréal) and a Bachelor of Science degree in Applied Chemistry from Université de Sherbrooke. He also completed the executive program of the University of Michigan Business School, and CN’s Railroad MBA program. For this article, I spoke with Ruest at CN headquarters in Montréal. 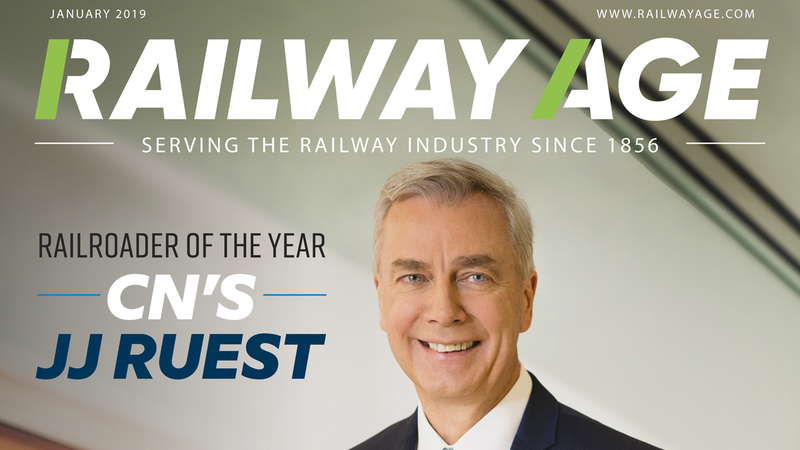 RAILWAY AGE: I would like to congratulate you on being selected our 2019 Railroader of the Year. This award goes back to 1964, and at CN of course you have predecessors—John Cann, Paul Tellier and Hunter Harrison. So, congratulations. RUEST: Thank you. I’m extremely proud on behalf of the CN team. I know there’s a lot there, because I remember when Paul Tellier was Railroader of the Year after what were my early days at CN at that time, and I was quite impressed that somebody like Paul, who came from outside of the industry, could be the Railroader of the Year, and then was even more proud when Hunter, shortly after we had the merger of 1998-1999, also became Railroader of the Year. It was a huge endorsement at that time of the transformation we were going through. We’re again going through a transformation. We had a challenge last winter and we’re getting back on our feet, but also we are on the verge of having a transformation of what is Precision Scheduled Railroading at CN. So for all these good reasons, but especially on behalf of the 25,000 employees at CN, I’m extremely proud that I was selected. RA: I’d like to talk about your background a bit, your family, where you are from, your interests growing up. RUEST: I’m a Canadian from a small town called Drummondville. Back in the day, it was a big industrial town with a few large companies. My father was a blue-collar worker. He was a union man too, very involved in the union at that time. It’s a town that has some railway history. 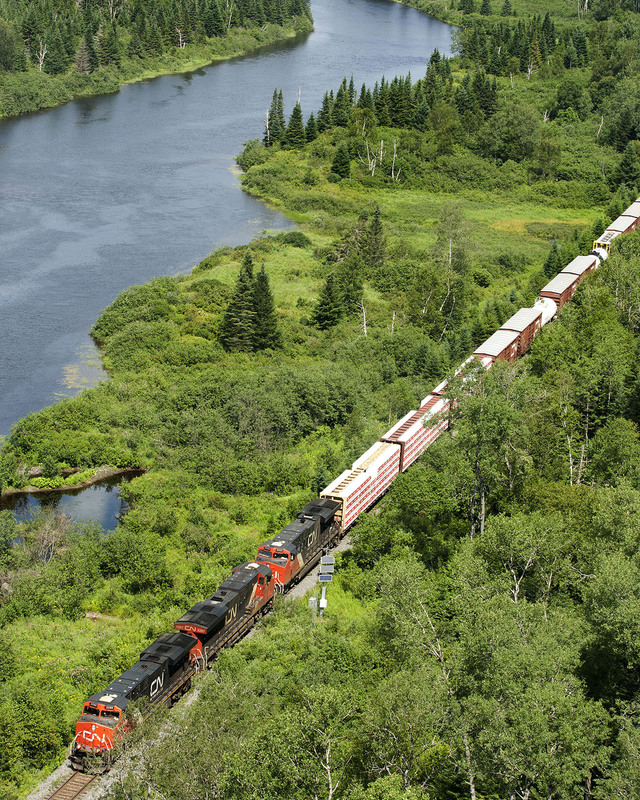 It’s on the CN main line between Montréal and Quebec City. This is where I was born, and raised for the first 16 years of my life. RA: You have an extensive background in applied chemistry. RUEST: That’s right. As a kid, I was encouraged to go to school and do different things, and it was a toss-up between being an engineer or an architect. I then went toward the science side of engineering, but the love was really about chemistry, so I earned a degree in applied chemistry, which got me into the chemical industry. I worked for two chemical companies, one of them for two years and one for 16 years. So my background is definitely heavy manufacturing, with products that tend to be hazardous, where safety is a high concern. I worked in a factory for two years, and after that customer service, sales, marketing, research and development, business development, and starting up product lines for businesses toward the end of the supply chain. I was doing purchasing of raw materials, the logistics of the finished product, and all of the planning of how much we made, how much we sold and who we sold it to. We were using all modes—water, truck, rail, with a lot of exchange. This is where I got to know, during my last two years, the railroad industry—Conrail quite a bit, CN, and up to a point the Illinois Central, because my company had a plant in Eastern Canada, but also in Louisiana. It was a large chemical company called Imperial Chemicals Industries, ICI. In Canada, it was known as CIL, and in the U.S., Geismar. I joined CN because of Paul Tellier. When you join a company, you always look at who is its leader, and you look at where it’s going. I was very impressed with Paul Tellier’s leadership at that time, with who he was and what he was going to do with CN. I was a believer in the strategy that CN had at that time. Privatizing a Crown Corporation, overnight, to be 100% private was very risky, but at the same time it was very, very appealing. So, what some viewed as a risk, I viewed as a huge potential upside. These two reasons are what brought me to this, being a chemist in the chemical industry to wanting to become a railroader at a time the company was going to go from fully governmental to private, and under the leadership of somebody that had a very strong vision for the company at that time, Paul Tellier. RA: So you worked in the latter part of your time at the chemical company quite a bit with the railroads: Conrail, Illinois Central, CN? RUEST: Yes, and CSX. We were making products that were traded between Canada and the U.S., north to south. We were not shipping very much west; we were shipping mostly south, and along the East Coast by water. Trucks went in a radius around these plants, and then rail went for long distances all the way north-south—basically from plants in eastern Canada all the way down to Louisiana, Florida and anywhere in between, using all the modes. I decided to learn about the rail network. The complexity at that time of doing business with the rail industry was huge. Coming from the chemical industry, I was quite amazed how complicated it was from a customer’s point of view—and I like the word customers, not shippers—to use a railroad. When I joined the railroad, there were a lot of things we did under Hunter Harrison and Jim Foote that really were meant to simplify transactions. We eliminated rebates and mileage payment on railcars, and we went to a per-car rate, the most simplistic unit, so that when you bought the services, you understood your cost without necessarily having to go through a series of add-ons and deductions. As a railroad customer back in the day, one of my frustrations was, OK, there are all these different elements, so what really are my costs? How was I to do the railroading side inside CN in a way that we would be a better service provider according to what my frustrations were when I was a customer? And under Hunter and Jim, we did a lot of those things. Today, it’s common to have everything on a per car-basis, with no mileage payments for private equipment. Also, we’ve converted the currency we used. It was neither Canadian funds nor U.S. funds; it was what I think was called “rail currency” at that time. We eliminated that, so now we always do business in real currency as opposed to rail currency. When you were shipping in the U.S., you had a choice between a U.S. rate and a Canadian rate, or another rate, which was a combination with a currency surcharge that was adjusted every two weeks. But why bother with a currency surcharge when you can just use the U.S. exchange rate and make it simple? RA: So, dealing with being a railroad customer at the time was rather intense? Would you say it was complicated, with currency surcharges and other financials? RUEST: Yes. Even back in those days, and I’m going back to being with CN for 23 years, it was so much easier to do business with a barge company or an ocean-going company or a trucking company than it was doing business with a railroad, especially if it was going to be an interline movement. This was the case for many manufacturers, where most of what you do is interline. For us, it was, how do we grow business in a way that we make it more conducive to do business with the railroads, CN in particular? Then, over time, we can maintain and grow shares and be profitable, and also present ourselves in a way that you don’t need to be a railroad guru to understand the railroad and do business with it. RA: Getting back to your coming to CN, who made the first move? Did you approach CN or did they approach you? RUEST: It was a combination of both. I would say it was somewhat CN, but the time was ripe. At ICI, we were going through major restructuring. A lot of the business had been sold. The management team and my mentor at that time, Norm Torgunsen, made an attempt to buy out the business unit. We actually made an offer to do a leveraged buyout of our business unit, to take it private and run it ourselves. We believed in what we had, but the leveraged buyout did not proceed. Rather than stay at ICI, I began looking to do something else, somewhere else, and at the same time CN was being readied to be privatized. This was in November 1995. I was in a field where the shareholders were losing interest. As a management team, we tried to became shareholders, but could not get it done. So I was looking for a company that had a vision of growing and getting things done, as opposed to withdrawing from the marketplace. And CN at that time was looking for talent from outside. You have to remember that, today, people look at Precision Scheduled Railroading the way it’s applied on any of the railroads, and how difficult it is. You can imagine how difficult it was to go from a Crown Corporation losing money to becoming 100% privatized overnight, and be totally on your own. We went from 33,000 people to 22,000, 100% privatized, cutting the link between the company and the government. That was very challenging, and there were a lot of people at that time who were naysayers. My view was that the potential was huge, and even though the risk was significant, it was most likely to work, and that this was the place to be. Two years later, when Hunter came in through the merger, it was another huge success and learning experience in my career. When you buy a company, you should look at the talent in that company as much as the assets of the company. We tend to look at a company as the map, the territory, the equipment it has, but also we should look very closely at the talent. In the case of Illinois Central, all the talent stayed with CN. There was another part of a fairly major transformation that was also quite difficult at that time, in hindsight. Today, people look at Precision Scheduled Railroading as something that can be done, but at that time there were a lot of naysayers who said it was going to fail. RA: So CN was really the first to do Precision Scheduled Railroading? It had been applied on a smaller scale at Illinois Central, but now it’s a much larger network, and it crosses a border. RUEST: It was applied on the Illinois Central, which was a smaller network, but when we did the merger there was one year between the time the merger was announced to the time it was approved by the STB. During that year, we did a lot of outreach with our U.S. customers, with the IC business train. I remember a trip specifically between Jackson [Miss.] and New Orleans where we stopped in every station and brought customers on board, doing a presentation about the merger and explaining to them the benefits of the merger. In between these meetings, I was with some of the IC executives, and we were learning about each other’s culture. So, I’m coming from Canada they’re coming from the South. They understand how Hunter works, and I understand partially how CN works, because I’ve been at CN for two years. So in between meetings where we were explaining the merger to customers, we were explaining to each other how we were doing business. This is where I got to learn about Hunter’s model and what sort of scheduled railroading was on the IC, and how they went through a phase of some challenges on the operations side and on the customer side. History has repeated itself a number of times, but I think the first time history was made was on the IC. Those customers remember the early days as a little bit challenging for them at the time. RA: Hunter has passed into history, and I guess you can call him a legend. What was it like working with him? There are the stories—the exaggerated stories, the tall tales, the true tales. What was he really like, from your perspective? RUEST: It depended on the day. You’re right: There are stories, there are tales, and everything gets bigger, especially five, 10, 15 years later. Stories are repeated with more humor or more sadness. But it was a time of learning the basics of railroading. The experience we had with Paul Tellier we also had with Jim Foote about leadership, and how you get a lot of people to do the things that need to get done. That may or may not be easy, but it needs to be understood and it needs to be done, otherwise we’re going to start slipping and go backward. It’s all about leadership and resolve. And that’s what I’ve been trying to do, especially since last spring—creating a sense of purpose, a sense of urgency, and then making decisions and move forward, without getting stuck in bureaucracy. When you look at large companies like all the very big railroads in North America, there comes a point where, because you’re large and you think you have time, you start to waste the most valuable part, which is time. You use more time than what you should. And you hesitate for longer than what you should, and you can do that for a period of time just because you’re big and you can survive these things. But in the long run, these are some of the huge mistakes. Coming back from where we were and what we learned the past 20 years to what we had to do last spring, is getting back to basics. Don’t procrastinate. Get the bureaucracy out of the system. You know the business, and you know what you need to do. Make decisions, move with a sense of urgency and get people to act as one. Everybody has his own style. Hunter had his own style; Paul Tellier had his own style. Jim has his own style. I have my own style. But I believe that, for any large team on a railroad, if you don’t play as one, it doesn’t matter how many assets you have, or how much capital you have. You won’t be as successful. You have to get to the point where there’s a common cause, a common focus. For those who don’t want that, you have to get them off the train and replace them with those that want to be on the train. If they don’t quite know how to do it, you have to teach them how. When it’s not quite clear where we should go, you should at least make sure you give people a common direction, and not leave them to making decisions as to what is required. RA: So what is JJ Ruest’s style? How would you describe it? RUEST: My style is to make a decision, to analyze, but not more than I have to. I ask my people, for example, when we have meetings, to really have a meeting. Whatever document you’re going to bring in, bring a smaller document, if you can put it in fewer words. Less is better than more. Leave time for discussion, and when the discussion is over, make a decision. We don’t leave the room saying we’re going to analyze this again. Most meetings have to end with a decision, or an action plan that will quickly lead to a decision. If we go from decision to decision, we can move on to the next thing. Otherwise, we’re just going to accumulate a bunch of issues that eventually will become extremely heavy, like we ended up having last winter. Go with what you know, be a student of the marketplace, learn from others, learn from leaders. One expression I use a lot is baseball. I often use examples of when I was a kid, when I played baseball. RUEST: They didn’t stay in Montréal long enough, but I was an Expos fan. I’m a fan of all team sports. A lot of what I do, and who I am, has to do with that. It’s so much more fun to do a team sport as opposed to an individual sport, because as a team there’s motivation. Baseball is one of those sports. I was never great at baseball, but I love the fact that it’s a team sport. You win together, and you lose together. My example of baseball: You’re at the plate—this goes back to my point about making a decision—the ball comes in, and it’s either in the strike zone or it’s not. If it’s in the strike zone and you don’t swing at it, that’s a mistake. If the ball keeps coming in the strike zone and you don’t swing at it, and strike out because you haven’t swung at it, that’s bad. As a kid, I felt bad if I struck out. I felt bad walking back to the bench, because I let my team down. As an adult I say the same thing. When the ball of opportunity or the ball of risk comes into the strike zone, you have to give it at least a shot, to swing at it, to try to make something out of it—a single, a foul ball. Protect the plate, make something out of it, but don’t let it go through and let your team down and let yourself down. Often, in large corporations, sometimes people look at the ball coming in, and they know it’s a strike. But they don’t swing at it. They hesitate and procrastinate. That’s where bureaucracy is really bad, and needs to be taken out of most large companies. RA: You’re a Canadian. Do you have any hockey analogies? RUEST: We have an initiative right now on talent, and where we want to use it. We want to exploit talent the same way we exploit capital investments. How we deploy talent is as important as how we deploy capital. Talent is like having a hockey team. You can only have so many players on the team, just like in baseball, and everybody that’s on the team needs to earn a spot on the team. Just because you’ve been on the team many years doesn’t mean you’ll always be on it. Every year you have to earn your spot. The beginning of a hockey season is in the summer; baseball is in the spring. There’s a spring training camp not just to warm you up, but basically to make the team again. When we do a job reduction or a restructuring, people need to remember that you have to earn your spot on the team. If you still have the talent but you lost your drive, you can’t keep your spot on the team. If you look left and right on the bench, you’ll realize eventually that your team players also resent the fact that you’re no longer putting in the effort. Therefore, as the coach, I have an obligation to get your spirit back or get you off the team. It’s not about how long you’ve been with us. It’s about whether those who play with you feel you’re contributing and not dragging them down. The coach’s job is making sure the people on the team have earned the right to be on that team. That right is earned. It’s not God-given. RA: With hockey, there’s the perception that, oh, it’s guys banging into each other, checking and roughing up the other players. But hockey is really a finesse sport that requires a lot of precision, a lot of coordination—like providing good service. RUEST: All these things mesh together. The challenge of our industry: Focus on the operating ratio, focus on cost, focus on growth, focus on safety, focus on asset utilization. How do we do that in a way that there’s finesse, and a balance among our objectives, so that we don’t fall into playing mostly defense or mostly offense? That we have a balance such that we can win more often than not, and that we can last a whole season and go in the playoffs? Because it’s not about having one good quarterly result. It’s about having a good solid year, and then, even better, creating a dynasty year after year. An example that links to hockey is the dressing room of the Montréal Canadiens. We had a town hall meeting at CN back in June following our tough winter where we brought all the top 200 CN employees into one of the hotels here in downtown Montréal. In one of the big convention rooms, we had all four walls decorated as if we were sitting in the dressing room of a big sports team. At the top of each wall we had a phrase that is actually in the Montréal Canadiens’ dressing room, which is about building a dynasty and carrying the torch from one captain to another captain, from one general manager to another GM. I think this is very much about the culture of CN—we cannot fail and we will keep it going, but in a way that is suited for what we are right now. Specifically, it’s a lot of focus on customer service and on growth, and also, up to a point, on acquisitions outside of rail, as long as they feed into rail. RA: Tell me about that tough winter. What happened, what led to the problems, and what did you do and your team do to get things back on track? RUEST: In simple terms, we entered the winter of 2017-2018 with not enough capacity in Western Canada. In the months leading to winter, we were already capacity-constrained on our Western network, mostly from Edmonton to Winnipeg and Winnipeg to Chicago. Capacity was already tight from the point of view of basic track capacity, qualified crews and locomotives. Winter always consumes power capacity because of harsh winter conditions and low temperatures. So coming into the winter with tight capacity made things worse. It was very difficult to recover because we needed better weather and more capacity. We had neither. As the winter wound down, things were a little better, but during that time it became important to have the team act as one, to actually do the best that we could with what we had at that time. So the first call to action, back in March, was, how do we make the best out of that and survive into the spring and early summer? Let’s convince the board to give us the extra capital so we can make quick decisions on investments. We didn’t need more time to analyze or agonize; we knew what we needed to do. We were able to convince the board as to what we needed to do, and got the signoff to get the funds. In the following two to three weeks, we quickly acted on our decisions with vendors and engineering to get things approved. We put out purchase orders for equipment, and for construction to be done in the summer. We had a shot of getting everything done during the summer and fall, and be ready for the winter. It was about acting as one, quickly, making decisions when there was still time left to really get ready for this winter. And when you look at our second-quarter results, they were mostly about using the assets we had on hand. Our third-quarter started to show the results of some of the assets we’ve been buying and deploying. RA: The current capital program has been among the largest chunks invested by CN, at least in recent years? RUEST: Yes. This year we’re at 25% of our revenue reinvested back in capex. But you know, that’s one way to look at it. Another way to look at it is return on invested capital, and our ROI is above 15%. We have Precision Scheduled Railroading, and we’ve had a good operating ratio for a long time. Now, it’s time for us to also focus on ROI and talk to our shareholders and the people that support us about ROI and the OR. If you have a good ROI, why would you not invest more capital if there is business out there? 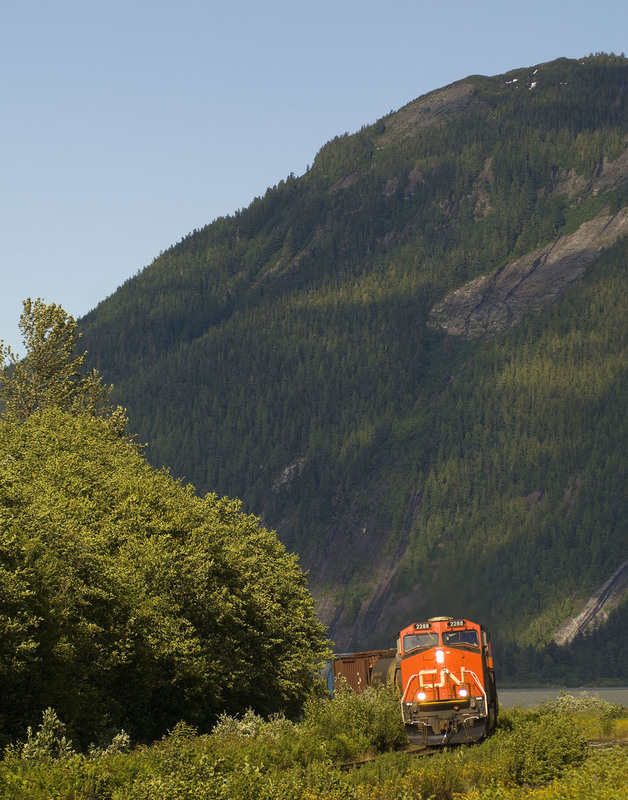 The rail industry is always talking big-time about growth, and for good reason. We’re always saying that we have a product that should be able to compete with the highway because we’re more fuel efficient, and we’re cheaper. But we’re still somewhat difficult to do business with, and sometimes we don’t have the assets or the capacity required to actually meet demand, but the demand is there. We need to invest so that we grow organically with the business, and address our pinch points with capital. So this year, we will also be spending probably in the range of 25% of our revenue back into capex. A large amount of that will be in Western Canada, where capacity is under the most pressure. RA: You’ve said that coal and crude oil are cyclical. Where are the growth opportunities, outside of the bulk commodities the railroad has traditionally hauled, like grain, which is heavily regulated . RUEST: There are really three buckets: Natural resources, which will always be the world of rail and barges—grain, potash, coal, iron ore. Manufactured products, where I came from in the chemical industry—rail-friendly because of large volume, and large rail-served facilities. Then there’s the real growth of the future, which has to do with consumers: 70%-plus of North American GDP is tied to consumers. The 70% will become 75% and 78%. I know Mr. Trump and Mr. Trudeau are trying to revive or protect the manufacturing sector, but growth in the economy comes from consumers, who generate a lot of freight. That kind of freight is today mostly on the road. It requires better and different service than for natural resources, where we use mostly unit trains, or manufacturing, where we use mostly carloads, origin to destination. Most consumer goods are not rail-serviced at origin or destination, and in many cases they don’t involve a full carload. RA: Are we talking intermodal or less-than-carload boxcar traffic? What about the “Amazon Economy,” where people are buying things online that require shipping—FedEx, UPS, local trucking companies? Where do you see the railroads fitting in? How do you improve that? RUEST: Railroads definitely fit in, and the product that makes the railroad the most relevant is the container, whether it’s the 40-foot ocean container or the 53-foot domestic container. So we basically need to be the supply chain partner of choice to do the long-haul part, but do it in a way that the first-mile and last-mile service, which is over the road, through a warehouse or through a FedEx, is able to successfully deliver against what is promised. Most of what Amazon delivers to your door is a single box. What’s in that box in many cases is not manufactured in North America. So it does come a long distance, in bulk, most likely in a container. The container gets cross-docked somewhere, broken up into small pieces that are aggregated with other pieces that go to another warehouse. For that, you need scheduled railroading, terminals focused on units, and a level of customer services that is more leading-edge than what we have. That’s why we bought a company called Transec, which some people say is a trucking firm. To us to, it’s not a trucking firm. It’s a company closer to the consumer end market. It provides a lot of temperature-controlled services. So as consumers buy a house or build a house, and fill it with white goods and furniture, and eat well year-round, these products are container services. It’s time for the rail industry to create the supply chains or to be part of a supply chain that always uses “the beast,” the rail network. We are a player in that supply chain, but we must be relevant to those that ultimately only buy small quantities or have service expectations higher than your typical natural resource or manufactured-goods customer. RA: We are really talking about information and infrastructure? RUEST: Investment in ports, or in systems that make us play well with the ports. Investment in intermodal yards. Investment in systems or partners to do the last-mile delivery over the road. Investment in or partnership with people who aggregate and disaggregate in warehouses from full containers to a truck that goes to a store as its destination. And doing this always in a way that our strength is the power of rail’s cost. In every solution, you want to fit in the rail solution for the long-haul, where you’re moving a full load. RA: How do short lines fit in? Like all Class I’s, you interface with a lot of them. RUEST: Short lines fit; here are two examples: The Indiana Rail Road, which has a container terminal in Indianapolis that to us is like a CN terminal. Think of it as a container terminal owned and operated by CN like a corporate store, or a container terminal on a short line or a private owner or a franchisee, but in both cases part of the same group. Most CN container terminals are corporate storefronts we own and we operate ourselves. But we also have container terminals I will call franchises. One is in Indianapolis on the INRD, and one in Regina (Saskatchewan) that is also a private ramp. It’s owned by another company, but they market it through us to overseas and domestic customers. This terminal has the same field services as our corporate stores or CN container terminals. But it allows the INRD to be connected to the West Coast. INRD can participate in world trade via CN, and CN can participate in business in and around Indianapolis. We can actually market to all CN customers. Typically, short lines have been viewed as an extension of Class I’s, mostly for carload merchandise service, but there are places where it has been proven that you can also do that with intermodal as long as there’s a willingness to actually be what I would call the franchisee of a storefront in a Class I network. These things come together better if it’s done from a brownfield site, where you take an existing underutilized merchandise carload yard and, using the same tracks and land, convert half into a container terminal. We did that on CN when we bought the Elgin, Joliet & Eastern in Chicago. We had a yard in Joliet, Ill., for manufacturing-related merchandise. Some of that business was not growing as in the past, so we took about one-third of that yard and turned it into a container terminal. It’s now two-thirds container. A short line can do the same thing. It’s a question of partnering with a Class I, and being part of its network as a franchisee store, with access to the same growth potential of long-haul economics. 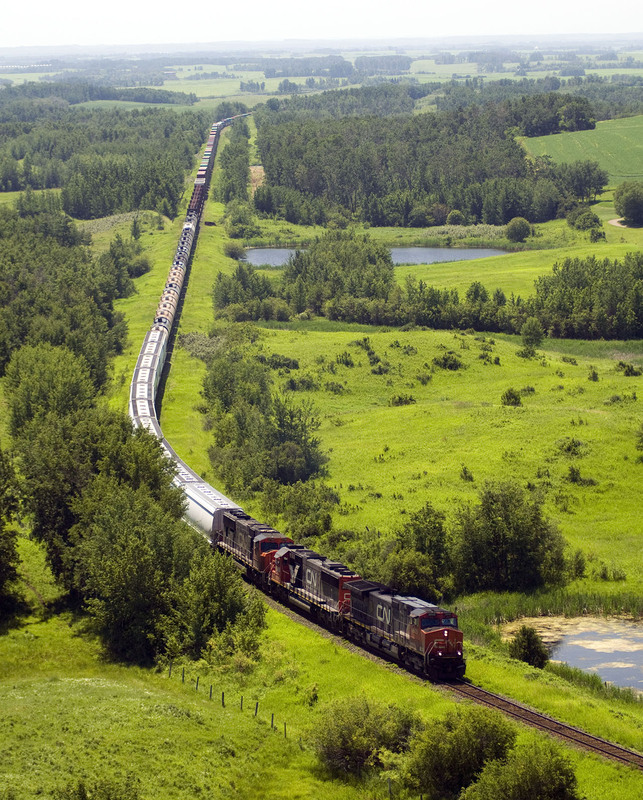 Between Edmonton and Calgary, likely outside Red Deer, Alberta, aerial view of freightTrain. Taken July 2 2013. RA: Where is CN going with technology? RUEST: Under Precision Scheduled Railroading, we’ve done a lot of the things that people know about—closing hump yards, selling lines, reducing headcount, parking locomotives, parking cars, etc. But there comes a point where you can only do so much of that, unless you decide you’re just going to shrink and stop your growth and just drive the operating ratio down. But basically, you are going to give up return on investment and potential profitable business. I would call this Precision Scheduled Railroading 2.0, where you grow, applying technology in ways that reduce operating costs. What we have right now are a number of initiatives that we are deploying across the network in 2019. One example of that is automation of train inspection. We are building portals—four in Winnipeg, two in Memphis and one in Chicago—where the train goes through the portal at track speed. It’s basically a roll-by inspection. RUEST: That’s right. Instead of having a person inspecting a train as it rolls by, it goes through the portal at whatever the track speed is on that segment. High definition cameras take pictures of the train as it goes by, and all the images go to a software program—artificial intelligence—where the software “learns” from what it sees, finds a defect, attaches that defect to the car number and sends out a work order for a carman to perform an inspection and repair. Over time, we will have a better car inspection program. We’re doing the same thing with track inspection. We will be equipping seven or eight boxcars with internal track inspection equipment, put them on the merchandise network and give them a schedule so they run around the network non-stop on regular trains, inspecting the rail bed and the rails, sending information on what needs to be fixed. Over time, we’ll have more preventive maintenance, less last-minute maintenance, and probably a safer network. Eventually we’ll use our skilled labor to fix things as opposed to inspecting them. All of that will also eventually give us a better, more reliable product and better service, because we’ll have less unplanned maintenance that needs to be dealt with. These are just a couple of examples. RA: What you’re talking about is Big Data: gathering massive amounts of data and putting it to good use. RUEST: Big Data, and software that learns by looking at this data and looking for defects. Over time, all inspection can be done by machine, so we can concentrate our skilled labor on fixing things as opposed to looking for defects. RA: Fix it before it breaks, right? RUEST: We have a new Vice President of Mechanical, Jim Sokol, who comes from the airlines. When we merged with the IC, we had a large influx of skill coming from another railroad. In the past two years, we’ve had an influx of talent coming from other industries. We have a new chief of mechanical, a new chief of engineering, a new CIO, a new chief of safety. Some come from BP Amoco, Southwest Airlines, FedEx. We’re bringing in skill from other industries that are somewhat like us so we can learn some of their best practices. In the airline world, where Jim is from, preventive maintenance on an aircraft engine is quite different than doing preventive maintenance on a locomotive. Aircraft engines can’t fail on line because that would be quite detrimental! Jim comes from an industry where it’s all about preventive maintenance. In the rail industry, it’s not quite enough about preventive maintenance. When a locomotive comes into a shop, what is it that we need to do so that by the time it leaves the shop it will actually be in service longer, and the chance of an on line failure is reduced? A big part of this is transforming our mechanical program in such a way that we are increasing the level of locomotive predictability and reliability, at the same time reducing the numbers of on line failures, which are very detrimental to service and cost and asset utilization. Right now, some railroads are talking about how many locomotives they’re parking. We have roughly 1,500 high-horsepower locomotives, and we are not going to be parking 300 or 400 because our fleet is already quite slim. It is extremely important for us with a fleet of our size that the fleet is actually in active service and fit for duty at all times. RA: On the railroad, if you have a catastrophic locomotive failure, you might clog up the entire system for hours, at least, or days or whatever, and it has a cascading effect. RUEST: That’s right. We saw some of that last winter. Our network, say from Halifax to Chicago, has excess capacity. If you have a locomotive that fails on line, it probably will not have an excessive amount of impact on other business because some of the network is double-track in the East. But when you go west and the network is already at capacity and under stress, and you have a failure on line, the cost of that ripple effect is quite significant. When you’re running close to capacity like CN, and you’re doing a capital program to add capacity, the capacity that you have now is very valuable. It’s very important that we make good use of that—namely, the rarity of the asset. That part of the network has to have a much higher up time, otherwise the cost of unplanned failures is more significant. RA: So, a lot of work has been done on the western part of your network under heavy traffic. What’s left to do? RUEST: Pretty much all the  work on the main line is done. We still have some yard work in Edmonton to complete before the winter is over. There’s more work coming up this year, which will be another very busy year of adding capacity out west—more sections of double-track, probably more sidings and maybe some yard work. It’s pretty much the same amount of work on the network as what we did last year to build capacity for the business we see coming at us, and also to build resiliency so we have the ways and means to deal with when the network is under stress, like in winter time or when business is strong. One example of that is crude by rail—from Edmonton going to the United States, going east, going to Superior, Wisc., going to the Union Pacific, BNSF or via the CN all the way to Louisiana, to Geismar and/or Baton Rouge. We weren’t expecting that the pipeline industry would have so many challenges to get things done, and right now the only safety valves it has left are cutting back production or shipping as much as possible by rail, or both. In order to use rail, you need the railcars, but you need the network. You need the double-track and sidings and the crews and the locomotives. The investment we’re doing out west will have an early, quick payback because the business in Western Canada is quite strong. RA: Many Canadians say, you don’t know what cold is until you come to Canada. I don’t think Canadians believe that anything higher than 20 degrees below zero centigrade is cold, but the last winter hit pretty hard. Has the winter weather been getting worse? Do you notice anything like that? RUEST: I think it’s like the southern U.S. You get the impression it’s not getting colder or hotter; it’s just getting more extreme. If you’re going to have a flood or a tornado, it seems to be more extreme. If it’s going to be hot, it may be hot for longer, and much hotter. The winter we may have in Canada this year might be a normal winter, but when we get to these extremes, it will be colder, and for longer. We deal pretty well with snow, because the grades we have in the Canadian Rockies are fairly flat. Typically, snow is not a big issue for our network, but sometimes it’s even tougher in Wisconsin, Minnesota and Chicago than on the Canadian network. But we’re more susceptible to very cold temperatures and also to how many days and sometimes weeks of cold we have, because it has an impact on train length. Winter comes every year, but it’s become more and more unpredictable. More of our locomotives work as Distributed Power because they actually allow us to be able to keep running longer trains. We also have 60-foot boxcars we call “air repeater cars”—basically a boxcar with an air compressor we put on the merchandise trains in the winter. Just like a DP locomotive, they help us maintain train length. People may still criticize our railroad for winter service problems, but what we do in the winter today is a whole lot better than what we did 10, 20, 30 years ago. These trains are longer than they were in prior winters, and we move a whole lot more gross ton-miles than in any other past winter. But let’s face it. Being a conductor at minus 35 degrees centigrade is not an easy job. And in wintertime, there’s less daylight and more nighttime—two shifts out of three when it’s dark. And when it’s dark in the Prairies, it’s typically colder. The wind just picks up and it’s a challenging environment, no question. Our employees had quite a challenge last winter working long nights, and with re-crews, maximum hours and maximum overtime, it was still not quite enough to get it all done. RA: The future, in terms of talent, attracting young people to the industry—not so much attracting them but retaining them. How difficult is that for CN? RUEST: We all compete for the skilled labor force, and we compete even harder when unemployment is as low as today—which we are not complaining about because it makes for good business. The economy is good, unemployment is low, so the labor pool is smaller. But at the same time, we have the good fortune to have more freight that wants to come to us, so it’s up to us to make ourselves more appealing to young men and women to come and work for the railroad, either in operations, mechanical, engineering or in the different functions that we have at headquarters. It’s about getting out the message that rail is a great industry, financially robust, with good benefits. We’re not going to go anywhere. We’re not closing factories. What we have is unique, so when you join the railroad you can actually make a career of it, whether you join the blue collar force or the white collar force. We provide relevant services, and as we work harder on our internal product, they’re even more relevant. We are built to last, and we will last into the next century. It’s up to us make that happen, and it is possible. Young people like to have the same technology they have at home, and we have to provide them with that technology, not just for us to lower our costs and be more efficient, but to actually retain the younger generation. I’ll give you two examples. Right now, we are deploying mobile devices for our crews and carmen. So if you’re a carman, you’re getting a tablet computer where, as you do your work, you report all your work. You actually enter that work on your pad, and at some point you might be using that pad to take pictures of the stuff that you’ve done so that you can archive it. That is what we do our AAR billing from. If you’re a crewperson, you’ll also be given a mobile device. It’s almost like FedEx, where you get your work order and report your work. Over time, we will use more and more of these devices through our “digital factory.” We will create more applications for these devices. We give you a $3 million locomotive, and then we give you a piece of paper and a pencil? That doesn’t work anymore. We have to deploy technology and digitize processes in a way that not only helps us bring down the operating ratio and makes the railroad more reliable, but also is more appealing for the workers of today and to how they want to work, as opposed to being stuck in the 1970s and 1980s. RA: You give people a paper form and a pencil, and they think, what’s this? The mindset is smartphones, tablets, computers, wi-fi, connectivity, information, and accuracy, too. RUEST: Yes, accuracy. For carmen, we have it deployed in four yards. You just mentioned, for example wi-fi. We have to deploy enough wi-fi signal in each yard or shop so there is wi-fi anywhere they might be doing their work. That becomes powerful. You enable people to do different things wherever they are. Eventually, we should be able to create more applications that will make work more interesting. That’s the next frontier of Precision Scheduled Railroading: applying technology that gives the new generation a working environment more like what they want, and a better chance of us retaining that talent. RA: Passenger rail: CN interfaces a lot with Metrolinx, AMT and VIA Rail, and Amtrak in the U.S. How would you describe your relationship with passenger carriers? RUEST: It is a challenge to have freight co-exist with passenger service because, especially in commuter service, it consumes a lot of capacity in a very short time, especially during peak hours in the morning and at night. It is difficult to co-exist, and it’s something that we need to get better at. But we own the rail lines; our first mandate is freight, and the capacity we deploy is for freight. There needs to be a recognition that capacity for passenger service has to be created by the user, with the funding required. Don’t force it. The people using freight service are citizens just like those using service. They’re people that work in factories trying to get their products to market, or in warehouses to which we deliver their product. I would describe each freight railcar that goes by as jobs or services in manufacturing or natural resources, and a passenger train as people trying to get to their jobs. There needs to be a recognition that both need to exist. 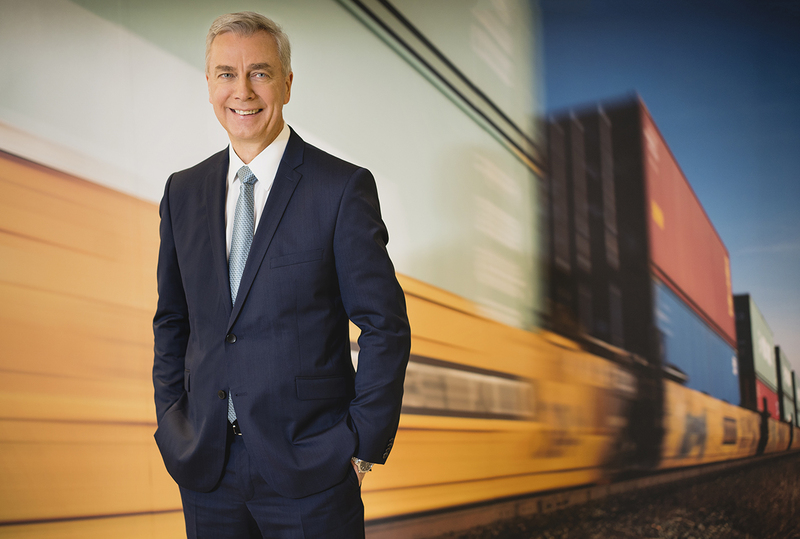 There have to be some concessions from time to time, but it does require capacity, and an understanding that as you give capacity to passenger service, you take it away from the freight sector. You have to do that in a way where everybody gets what they need, but it’s not first-come, first-served. RA: This is an opportunity for you to speak directly to your vendors. Do you have a message for them? RUEST: My message to them is, please help us to improve as an industry so we can gain more business. I’m not saying, “Give us your lowest price.” I’m saying, “Help us to lower our costs.” When I was Chief Marketing Officer at CN, I was always talking to my customers in terms of, “What we do can help you have lower costs and better service, but don’t always ask us to do it at a lowest price. Same thing with our vendors who support us: How can you help us gain more business and be more relevant to the world of transportation, such that, as a result, you gain more business from us, and we continue to buy services and deploy capital? Sell to us in a way that we can be lower cost, and provide service that’s reliable and safe. Every time you do that, you create more business for yourself. You increase the size of the pie in which all vendors can participate. It’s especially true in the world of non-traditional suppliers to the rail industry from the technology side. So if you’re a newer supplier to the rail industry, and you’ve been a supplier to, say, the mining industry and taught it how to do preventive maintenance on those big trucks, how would some of those things apply to a locomotive or a big rail network? What are those technologies that we could apply to our industry so that we can catch up with the times? My sense is that, from a technology deployment point of view, as an industry we’re slightly behind other industries. It’s not too late for us to catch up, but time is of the essence for us to figure out how to use technology smartly. Suppliers can help us to do that. We always like lowest price, but we are really interested in lower costs and solutions that are innovative in more ways than one. RA: You’ve been in the CEO role now for a relatively short time, but you’ve been with the company a long time. What was it like being thrust into the role? RUEST: Coming from the commercial side, I understand some of the regulatory space, the customer side, the logistics side, the supply chain within and outside North America. I’m now discovering new stakeholders, meaning a lot of involvement with regulators and politicians, and a lot more engagement when it comes to safety. How we use technology is something I really enjoy. We’re a very large company in North America. 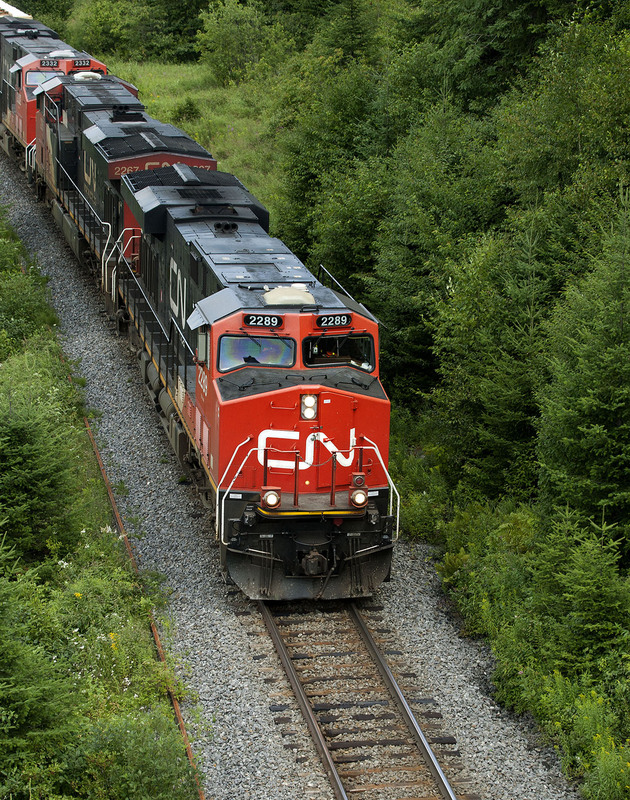 CN has a much bigger role in the economy than one might think. In Canada, we have the fourth-largest market cap—$80 billion-plus—with three Canadian banks in front of us. We matter to the Canadian economy, and when that economy has issues, sometimes we get dragged right into the middle, whether it’s issues with the lumber trade into the United States, with NAFTA, or crude by rail and pipelines, or grain. We’re a corporate citizen that matters. We’re either central to or a large part of these issues. That’s the part I’m discovering, and I’m enjoying it. But at the same time, we cannot always have the solutions people are looking for immediately. We are not always on stand-by with all the goods and services to step in and fix something that should have been fixed a long time ago. I want to thank all of our employees at CN for their constant support, especially last spring and last winter. We had a really tough winter to get through. We came out again as a team. The message to the team: Hang in there. We’re investing. We are giving ourselves the tools to be successful, and we will be successful. That’s the commitment we have to our customers, our shareholders, government regulators, and more important, to ourselves. We’ve earned the right to be successful. Thank you everybody for your support to keep on going down that path. And thank you to Railway Age to give this recognition to CN and to me. I want to thank my mentors from the past—Paul Tellier, Hunter Harrison, Jim Foote, Claude Mongeau, and Norm Torgunsen from my days in the chemical industry, and to my father, for all the teaching they provided over the years. Now it’s up to me to give that same teaching and coaching back to the people that work for me and around me.